1: The Valencia Economic Forum —Catalan agricultural issues. The land redistribution decree. A national plenum with an economic focus. Creation of a labour inspectorate. Remuneration arrangements. Establishment of a Trade Union Bank. The Trade Union Insurance Agency. Confederal publications. Intensification of consumer cooperatives. Administrative centralisation on a mixed footing. The Confederal Economic Council. Federations of Industry and general labour regulations. The Spanish stock-breeding question. 3: From Victory in Teruel to Disaster in Aragón — The build-up to the offensive. The capture and loss of Teruel. A critique of the operation. The collapse of the eastern front. The offensive grinds to a standstill. Another week of tragedy in Barcelona. The workers desert the factories under furious air raids. The responses from the trade union organisations and Popuar Front. Cabinet reshuffle. The volunteer battalions. The Executive Committee of the Libertarian Movement. Sanctions on militants. Sub-committees in the central zone. A manifesto from the CNT’s national sub-committee. The Catalan CNT and UGT sign up to a new agreement. Tracking the disaster in the east. Generalities. 4: The Libertarian Movement’s crisis within — The Geneva life-belt. The alleged disintegration of the enemy rearguard. The miracle of the Marne invoked. Operations in the Alt Segre. Nostalgia for guerrilla warfare. The oppressive shadow of hunger. Doctor Negrín’s 13 Points. The FAI’s reaction. The CNT enraptured. The poisonous impact of defective reasoning. The FAI lowers its flag. The crisis within the Libertarian Movement. 5: The August Crisis and the Battle of the Ebro — Plenum of the Libertarian Movement in Catalonia. National Plenum of the CNT regional committees. The political truce called off. Recuperation and state taske-over of the revolution’s gains. The August crisis. State take-over of the war industries in Catalonia. Silence from the CNT and objections from the FAI. The ‘reform’ of the Commissariat. The political crisis resolved. The SIM, Negrín’s political skeleton key. The offensive grinds to a halt in Catalonia. The battle of Levante. The Ebro gambit. A war of attrition. The retreat. A critical report from the FAI’s military secretariat. 6: Francoist Policy — Italy and Germany critical of their military suggestions being ignored. Signs of guerrilla activity in the North. The threat of French intervention. Sketch of the Francoist rearguard. The Anglo-Italian agreement or the Republic stabbed in the back. The Czechoslovak crisis and the threat of world war. Franco assures France that he will remain neutral. The volunteers withdrawn. Fresh urgent demands for war materials. Forceful economic pressure from Germany. The mining legislation of 9 October. Goering’s wrath or the gun to Franco’s breast. The draft German-Spanish treaty. The evasive twists and turns of Francoist policy. The mining compensation legislation. 7: The State Take-Over of the War Industries — The phases of and pretext for the take-over. Conversations in Valencia and in Barcelona. The Russian advisors bring about failure. Regarding the 11 August decree. The committees cave in and the workers stand firm. The resistance in Madrid. The resistance in Valencia. The War Industry Council, the final redoubt. The UGT switches sides. Situation of the war industries in the Centre-South-Levante zone. Factories turned into penal colonies. The take-over process in Catalonia. The aircraft plants in Sabadell. The Elizalde and Hispano-Suiza works. Managerial chaos and the blight of bureaucracy. Falling productivity levels. The Catalan metalworkers stand their ground. More on the dark chapter of the Purchasing Commissions abroad. 8: Libertarians and Communists in the War — Loss of morale as a factor in the defeat. The need for fresh officers. The hundred thousand sons of Negrín. The nascent military caste. Nonsensical and partisan discipline. Hunger in the rearguard. ‘Resist! Resist!’ The Soviet high command in Alcalá de Henares. The Under-Secretariat of Land Forces, a recruitment machine. The file on Antonio Cordón. A flurry of admissions to the War School. A tailor-made army for Modesto. Promotions, dismissals and other monopolies. A political map of the army. The work of the cells. The International Brigades seen from within. The 43rd Division’s ‘heroics’. 9: Terror on the Front — Murders in the front lines reported to the Defence Minister. Minutes of a gathering of communist servicemen at which the decision was made to exterminate political adversaries. From words to deeds. Several cases of murder. The craven murder of Turón. An official document on this collective criminality. A further series of killings. The case of José Meca, Juan Hervás and Jaime Trepat. The terror policy in the army health corps. Mysterious deaths in field hospitals. Towards ‘conquest’ of the 153rd Brigade. A systematic campaign of murder. The 26th Division’s ‘Durruti’ groups make common cause with their downtrodden brethren. The final ‘conquest’ of the brigade. 11: From the October Plenum to the Loss of Catalonia — The national plenum of the Libertarian Movement’s regional committees. Proceedings, stances and resolutions. A glimpse of the Negrinist Byzantium. The CNT’s fatalism and snorts of orthodoxy from the FAI. The third part to the discord. Sounding the alarm and the blackmail to which it gave rise. The meeting in Pedralbes. Crumbs for the Basque government and Generalitat. The CNT rumpus. A flood of literary heroics. Confronting the awful truth. A short military assessment. The forecasts of the central high command. ‘Bring on the bull!’ The final push against Catalonia. The Army of the Ebro collapses. Valiant resistance from the 26th Division. The fall of Barcelona. Negrín’s bombast. The ‘Republic of El Cadí’. Exodus. 12: The Last Bulwark — The position in the Central Zone in the wake of the loss of Catalonia. General mobilisation. Declaration of a state of war. The libertarians deploy their defences. Criticism of the offensive operation in Extremadura. Arrival of Negrín. The government of ‘resistance’ begins to wind things down. Report on the loss of Barcelona. Watchwords from the committees now in France. What it was like to talk to Negrín ‘as an equal’. Cipriano Mera’s indiscipline. Britain and France recognise Franco. Azaña resigns. The ‘political issue’. Friction between the FAI and the CNT. Minister Segundo Blanco’s eccentricities. Measures to counter an imminent pro-Negrín coup d’état. 12: Woe to the Vanquished — The communist high command in the Centre-South Zone. The meeting between Casado and Negrín. The meeting at the Los Llanos aerodrome. Two competitors racing against time. ‘The first strike has double the effect’. The Negrinist ploy frustrated. Proclamation of the National Defence Council. The government’s craven flight. Events in Cartagena. The fleet absconds. The communist revolt against the Defence Council. Move the 14th Division up to Madrid! Moscow’s henchmen surrender. The Libertarian Movement’s national committee. Negotiating with the enemy. Unconditional surrender! Negotiations break down. The enemy onslaught and the collapse of the front lines. A soldier’s peace. Evacuation arrangements. Negrín’s revenge. Humaniarian appeals to the democracies go unheeded. Two exhibits for the prosecution. Alicante. Vae victis! 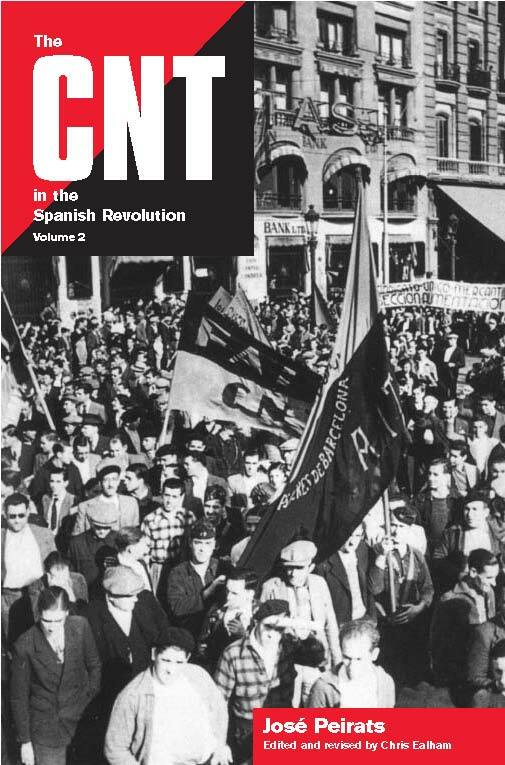 CONTENTS of Vol 3 (1938-1939) —Glossary of organisations The history of Spanish anarchism in the English language by Chris Ealham 1: The Valencia Economic Forum —Catalan agricultural issues. The land redistribution decree. A national plenum with an economic focus. Creation of a labour inspectorate. Remuneration arrangements. Establishment of a Trade Union Bank. The Trade Union Insurance Agency. Confederal publications. Intensification of consumer cooperatives. Administrative centralisation on a mixed footing. The Confederal Economic Council. Federations of Industry and general labour regulations. The Spanish stock-breeding question. 2: The New Trade Union Platform — Take-over of public entertainments in Catalonia. The collectivists respond with a general strike. A typical compromise arrangement. Clarification of the ‘collectivisation decree’. Towards a new trade union unity platform. The UGT’s proposals. 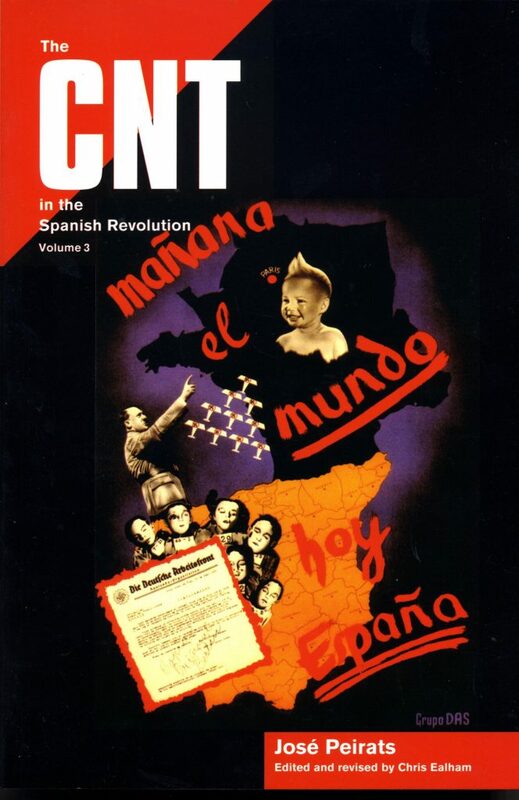 The CNT’s counter-proposals. ‘Marx and Bakunin would embrace one another’. Francoist military pressure a factor in the agreement. The 2nd FIJL national Congress. Autonomy and centralism. The new Peninsular Committee. 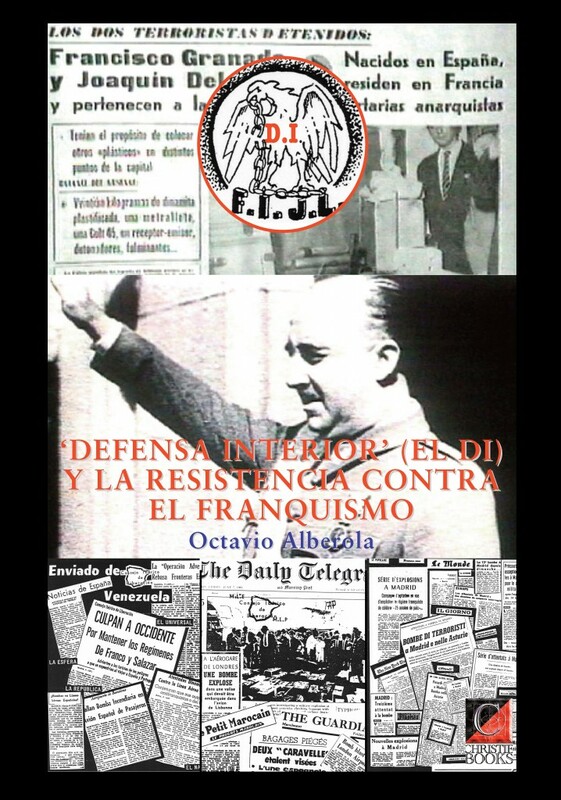 Basis of the Anti-fascist Youth Alliance (AJA) 3: From Victory in Teruel to Disaster in Aragón — The build-up to the offensive. The capture and loss of Teruel. A critique of the operation. The collapse of the eastern front. The offensive grinds to a standstill. Another week of tragedy in Barcelona. The workers desert the factories under furious air raids. The responses from the trade union organisations and Popuar Front. Cabinet reshuffle. The volunteer battalions. The Executive Committee of the Libertarian Movement. Sanctions on militants. Sub-committees in the central zone. A manifesto from the CNT’s national sub-committee. The Catalan CNT and UGT sign up to a new agreement. Tracking the disaster in the east. Generalities. 4: The Libertarian Movement’s crisis within — The Geneva life-belt. The alleged disintegration of the enemy rearguard. The miracle of the Marne invoked. Operations in the Alt Segre. 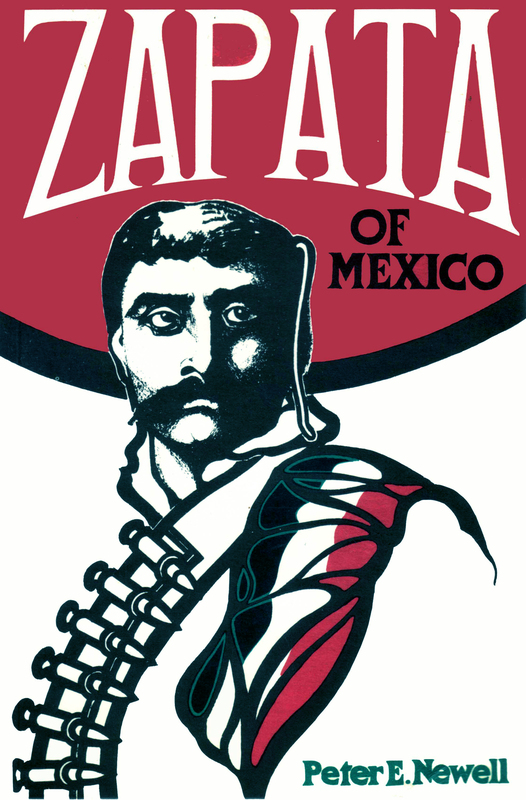 Nostalgia for guerrilla warfare. The oppressive shadow of hunger. Doctor Negrín’s 13 Points. The FAI’s reaction. The CNT enraptured. The poisonous impact of defective reasoning. The FAI lowers its flag. The crisis within the Libertarian Movement. 5: The August Crisis and the Battle of the Ebro — Plenum of the Libertarian Movement in Catalonia. National Plenum of the CNT regional committees. The political truce called off. Recuperation and state taske-over of the revolution’s gains. The August crisis. State take-over of the war industries in Catalonia. Silence from the CNT and objections from the FAI. The ‘reform’ of the Commissariat. The political crisis resolved. The SIM, Negrín’s political skeleton key. The offensive grinds to a halt in Catalonia. The battle of Levante. The Ebro gambit. A war of attrition. The retreat. A critical report from the FAI’s military secretariat. 6: Francoist Policy — Italy and Germany critical of their military suggestions being ignored. Signs of guerrilla activity in the North. The threat of French intervention. Sketch of the Francoist rearguard. The Anglo-Italian agreement or the Republic stabbed in the back. The Czechoslovak crisis and the threat of world war. Franco assures France that he will remain neutral. The volunteers withdrawn. Fresh urgent demands for war materials. Forceful economic pressure from Germany. The mining legislation of 9 October. Goering’s wrath or the gun to Franco’s breast. The draft German-Spanish treaty. The evasive twists and turns of Francoist policy. The mining compensation legislation. 7: The State Take-Over of the War Industries — The phases of and pretext for the take-over. Conversations in Valencia and in Barcelona. The Russian advisors bring about failure. Regarding the 11 August decree. The committees cave in and the workers stand firm. The resistance in Madrid. The resistance in Valencia. The War Industry Council, the final redoubt. The UGT switches sides. Situation of the war industries in the Centre-South-Levante zone. Factories turned into penal colonies. The take-over process in Catalonia. The aircraft plants in Sabadell. The Elizalde and Hispano-Suiza works. Managerial chaos and the blight of bureaucracy. Falling productivity levels. The Catalan metalworkers stand their ground. More on the dark chapter of the Purchasing Commissions abroad. 8: Libertarians and Communists in the War — Loss of morale as a factor in the defeat. The need for fresh officers. The hundred thousand sons of Negrín. The nascent military caste. Nonsensical and partisan discipline. Hunger in the rearguard. ‘Resist! Resist!’ The Soviet high command in Alcalá de Henares. The Under-Secretariat of Land Forces, a recruitment machine. The file on Antonio Cordón. A flurry of admissions to the War School. A tailor-made army for Modesto. Promotions, dismissals and other monopolies. A political map of the army. The work of the cells. The International Brigades seen from within. The 43rd Division’s ‘heroics’. 9: Terror on the Front — Murders in the front lines reported to the Defence Minister. Minutes of a gathering of communist servicemen at which the decision was made to exterminate political adversaries. From words to deeds. Several cases of murder. The craven murder of Turón. An official document on this collective criminality. A further series of killings. The case of José Meca, Juan Hervás and Jaime Trepat. The terror policy in the army health corps. Mysterious deaths in field hospitals. Towards ‘conquest’ of the 153rd Brigade. A systematic campaign of murder. The 26th Division’s ‘Durruti’ groups make common cause with their downtrodden brethren. The final ‘conquest’ of the brigade. 10: Terror in the Rearguard — The SIM, the new Spanish Inquisition. The cheka in the former convent of Santa Ursula. Evolution of the police. The SIM commanders and their advisors. Their immorality and criminality. The impact abroad of these crimes. Fact-finding teams in Spain. The communist press counter-attacks. The ‘comrades from special services’. The GPU frames the POUM. How Andreu Nin was done to death. ‘No more “being taken for a ride”!’ The POUM on trial. The accused, the witnesses and the verdict. ‘We must, and do convict.’ 11: From the October Plenum to the Loss of Catalonia — The national plenum of the Libertarian Movement’s regional committees. Proceedings, stances and resolutions. A glimpse of the Negrinist Byzantium. The CNT’s fatalism and snorts of orthodoxy from the FAI. The third part to the discord. Sounding the alarm and the blackmail to which it gave rise. The meeting in Pedralbes. Crumbs for the Basque government and Generalitat. The CNT rumpus. A flood of literary heroics. Confronting the awful truth. A short military assessment. The forecasts of the central high command. ‘Bring on the bull!’ The final push against Catalonia. The Army of the Ebro collapses. Valiant resistance from the 26th Division. The fall of Barcelona. Negrín’s bombast. The ‘Republic of El Cadí’. Exodus. 12: The Last Bulwark — The position in the Central Zone in the wake of the loss of Catalonia. General mobilisation. Declaration of a state of war. The libertarians deploy their defences. Criticism of the offensive operation in Extremadura. Arrival of Negrín. The government of ‘resistance’ begins to wind things down. Report on the loss of Barcelona. Watchwords from the committees now in France. What it was like to talk to Negrín ‘as an equal’. Cipriano Mera’s indiscipline. Britain and France recognise Franco. Azaña resigns. The ‘political issue’. Friction between the FAI and the CNT. Minister Segundo Blanco’s eccentricities. Measures to counter an imminent pro-Negrín coup d’état. 12: Woe to the Vanquished — The communist high command in the Centre-South Zone. The meeting between Casado and Negrín. The meeting at the Los Llanos aerodrome. Two competitors racing against time. ‘The first strike has double the effect’. The Negrinist ploy frustrated. Proclamation of the National Defence Council. The government’s craven flight. Events in Cartagena. The fleet absconds. The communist revolt against the Defence Council. Move the 14th Division up to Madrid! Moscow’s henchmen surrender. The Libertarian Movement’s national committee. Negotiating with the enemy. Unconditional surrender! Negotiations break down. The enemy onslaught and the collapse of the front lines. A soldier’s peace. Evacuation arrangements. Negrín’s revenge. Humaniarian appeals to the democracies go unheeded. Two exhibits for the prosecution. Alicante. Vae victis!